Although the cushion is too thin for comfort, it is nice looking. Add a splash of color to your indoor or outdoor living space with the custom made swivel rocker cushion by Blazing Needles Soft Home Furnishings. 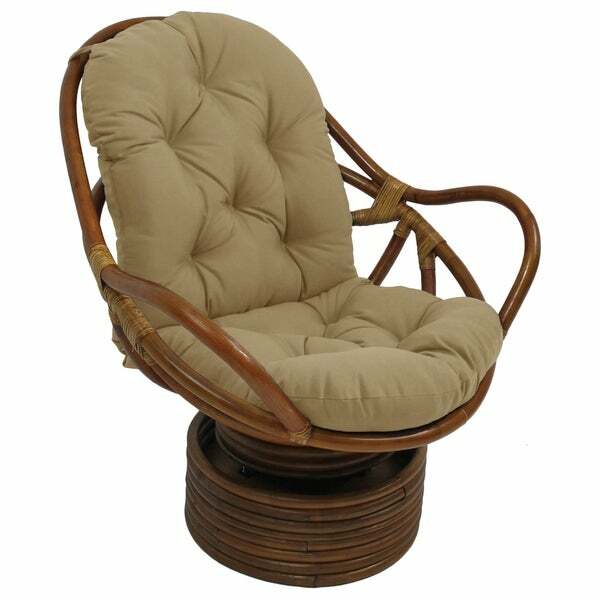 This premium rocker cushion features a tufted and thick design for maximum comfort. Even better, it comes in several solid color options, giving you the flexibility to choose a style that fits your room or patio. The 100-percent spun polyester cover is sewn shut to securely keep the green-friendly blown polyester fill in place, ensuring a comfortable seating experience time after time. The classic solid color pattern is perfect for adding drama to any decor. Maintenance is easy: simply spot clean the cushion when needed. Dimensions 48.0 In. X 24.0 In. X 5.0 In. Very comfortable cushion and fit my old chair perfectly. For an outdoor cushion, it is remarkably soft.